So my 1st born has been invited to his first sleepover at his friend’s house next week. Harry is full of excitement and having stayed at his Nan’s & Aunties before I don’t have any worries about him getting homesick but like any Mum I want him to have a few home comforts. We purchased our first Trunki a few years ago when we took Harry to Spain and it makes going through the airport a breeze. Having taken it on many more holidays since Spain it’s a wee bit battered but still a much-loved part of our family trips away and does come with a 5yr guarantee. 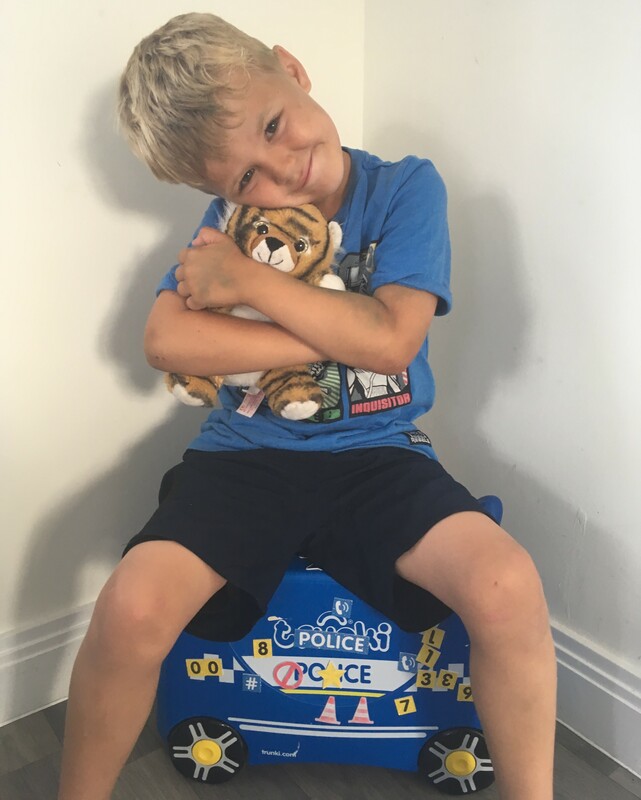 We were delighted when Trunki sent us their brand new Percy the Police Car Trunki to review so when Harry was asked if he would like to stay at his friend’s house the answer was always going to be yes, I just wanted to send him with all the essentials he was going to need and our Trunki will come in handy again. The benefit of having a Trunki is its super light so whereas Harry maybe a little old for sitting on his Trunki he is able to pull it along himself and even carry it when he needs to. 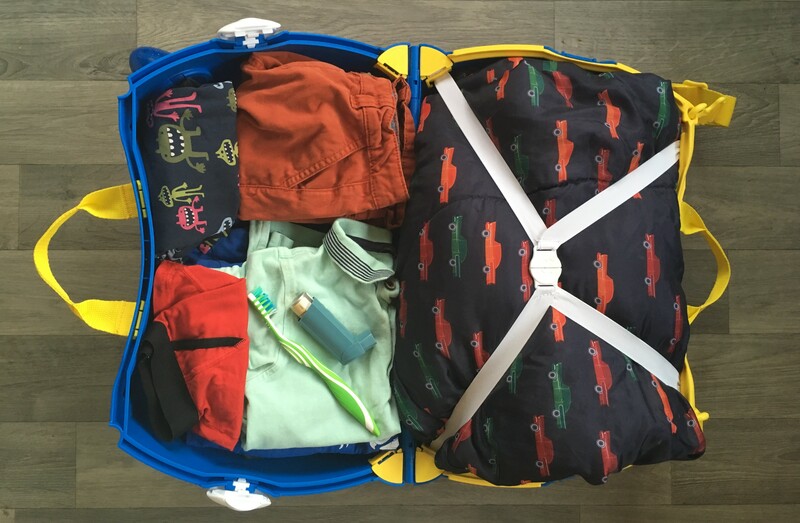 It’s the perfect size for hand luggage so when we travel to Disney World at the end of the year I know I will be able to pack enough items in there to keep both Harry & Charley entertained on the flight and have room for a spare set of clothes each. Harry is excited to show his new Percy The Police Car Trunki off to his mates at the sleepover and has helped me with a list of things he wants to pack. So what does a 6-year-old need to sleepover at their friend? 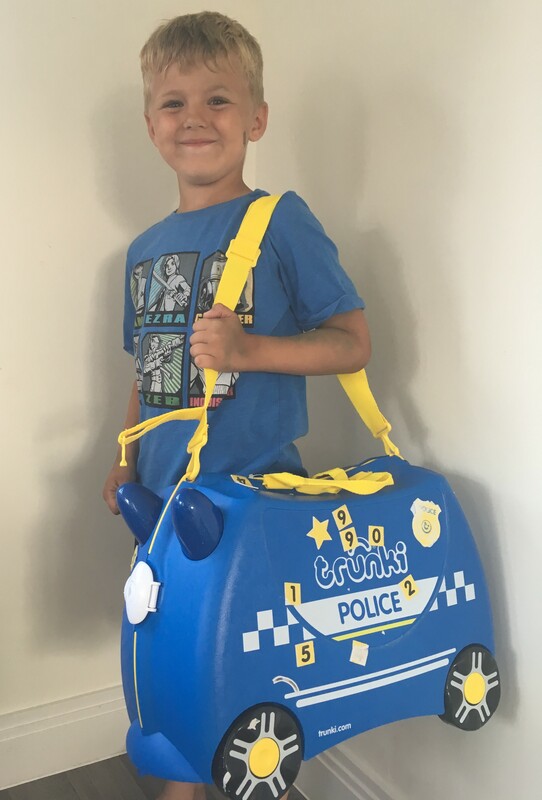 Percy the Police Car Trunki – This is the latest design released by Trunki, comes with customisable stickers and perfect for any child who loves playing cops & robbers. A cool pair of PJ’s – Harry’s present love is anything to do with aliens. Socks – All black as this makes it easier to find pairs. 1 pair of shorts – All the better for showing off his skinny legs. Sleeping Bag – With Mum’s perfume sprayed on it. If you like the look of our Percy the Police Car Trunki then enter my competition below to win your very own. The competition is open now and will close at 11.59p.m next Thursday 05th July. The winner will be picked at random and have their Trunki delivered directly from the brand. You can enter as many times as you like over the next 7 days. Good Luck !!! The Percy The Police Car Trunki Was Kindly Gifted To Us For The Purpose Of Review But All My Thoughts & Opinions Are My Own. "Making The School Run a Breeze With The Micro Trike"
"Creating Curves With The Perfect Shapewear"
It would be great for the kids when we go on our holidays. My daughter has always wanted a Trunki and this would be perfect for her as we are often traveling to visit my parents and her daddy when he’s working abroad. Everyone else seems to have one so I’d like to try them out. They seem so handy and fun for the kids. I’m sure my boys would love one to take on holiday this year. Thank you for the chance to win! I’ve heard so many great things about Trunki – it would come in super useful, I’m sure! My eldest granddaughter has had a grufflo trunki for quiet a few years, and has loved using it, we now have another granddaughter, so it would be great for her to have the fun of owning her very own trunki. I would absolutely love one of these for my nephew! He loves police cars and it would be perfect for when he comes to stay with us! I would love one of these for my daughter she loves travelling and taking an array of things with her.. she would be thrilled with this. So my granddaughters can help poor old me with all the luggage !! For my little gransdon when he goes to visit his other nana to take his toys. I know just the right little person for this trunkie -so fingers crossed. i need a Trunki in my life to keep my daughter quiet. She is always on about getting one of these! For my son for travelling travelling Io the USA to visit his nan and papa. Oh this would be brilliant for my little one! He would love it for going on holiday! Great idea for a child’s luggage. This is one of the best trunkis I have seen. I would love to win this for my daughter, it would be great for our holiday this August. my granddaughter woul love a Trunki. I need it for my niece, perfect for our adventures in the summer. A trunki would be great for when my niece stays over. My little boy would love this! His big sisters both had one when they were younger and they are fab! This would be great for my 3 year old, he’d love it for holiday and it would double up as something he could ride on. I need a trunki for my daughter to take on our summer holiday. 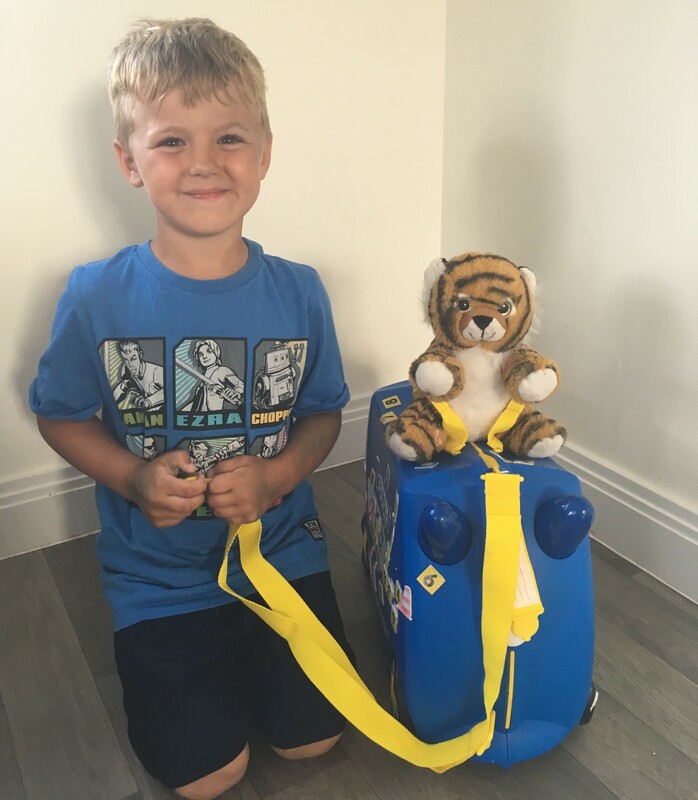 I would love to win a trunki for my son as it will get him involved in the packing in a fun way as well as being something entertaining to take with him on holidays! We are about to take our 1St ever holiday abroad and I am looking to entertain my 2 year old Lexie every step of the way…having a Trunki could be an immense part of it! I need a trunki in my life for my twin 4 year old girls who love their own luggage but don’t like walking far!